It’s finally beach and pool season!! Make sure you are beach bag ready with the essentials listed below. 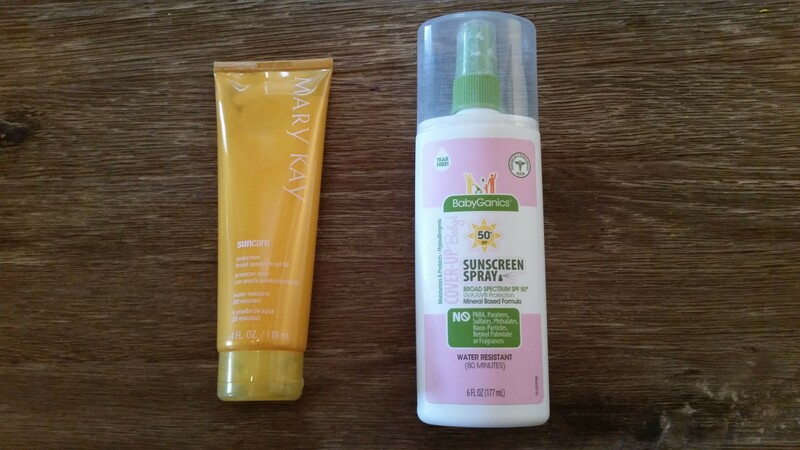 Sunscreen – Since I own my own Mary Kay business, I am partial to their wonderful sunscreen for myself. On the other hand, when it comes to kids it is so much easier to use a spray type sunscreen on them. I currently use and like BabyGanics Sunscreen Spray on my son. PS – They also have a great bug repellant. Reading material – Whether it’s that book you have been waiting all year to read or the latest issue of your favorite magazine, this is the time to relax with your favorite read. Hat – A good hat can protect your scalp, face and even neck from the sun’s harmful rays. Plus, it is a cute fashion accessory. Try choosing a hat that is light weight, breathable and with a wide brim. Target has many cute options for floppy hats right now and at a great price. I love this neutral colored one! Baby wipes – These are important for the obvious reasons but can be used for so many other things. For example, they are great for wiping your hands after applying that suntan lotion. Snacks and water – Sitting and playing in the sun can quickly dehydrate you! So make sure you drink up the H2O. If you are anything like me, you get hungry about every two hours! A snack (one that doesn’t melt easily) is a must for my beach bag. Cover-up – You can choose many types of cover-ups from tunics to t-shirts. My personal preference is a dress style cover-up. With one simple piece, slipped over the head, you are ready to run into the store, gas station or even restaurant. Sunglasses – There are many, many options out there but keep this in mind when choosing a pair. Make sure they are large enough to cover your eyes well and have UVA and UVB protection. My personal preferences are Aviator or Wayfarer styles. Sandwich bags – This may seem odd but these come in handy when you have valuable items near water! This is especially important for items like your cell phone and wallet. I hope this list helps you prepare your bag for some fun beach or pool time. Please let us know what other things you consider essentials for your beach bag.